AHRC New York City is proud to congratulate two young adults as they receive accolades for their work at Brooklyn Blue Feather Elementary School, (BBF). 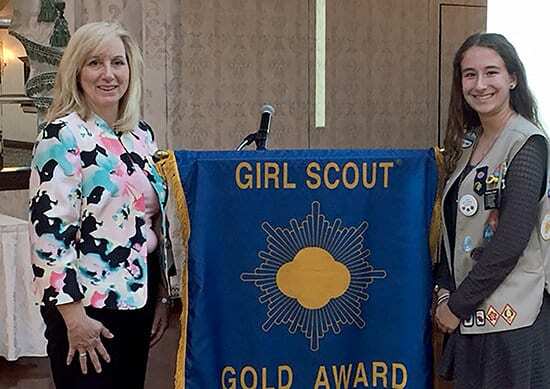 Kristen Alvy was awarded the highest honor in Girl Scouts, the Gold Award! This honor is awarded to just one percent of all registered Girl Scouts. There are many components of the award but the most important is the service project. Kristen had to plan, write and execute a sustaining community project. Her project was about literacy at BBF. Kristen spent two summers, (over 85 hours,) visiting our school to read stories to each class. During the winter months Kristen made about one hundred work folders, collected gentle used books, organized them by reading level, and delivered them to the school. She provided the school with over a thousand books! She also created a book return box for the library. When BBF Principal, ZoeAnn Deeds asked Kristen what was her favorite part of the project, her response was “reading to the students.” Kristen plans to attend college to become a teacher. Thanks, Kristen, for all you have done for the school! Similarly, the Boy Scouts‘ highest honor is to become an Eagle Scout. Less than five percent of all registered Boy Scouts achieve this rank. It requires a Scout to earn at least 21 badges and to develop, create, fund-raise, and execute a sustainable community project. David Kim, under the leadership of Scoutmaster, Vincent Cirino, refurbished the school’s courtyard. He made the area more inviting and pleasing for the students at the school. The students are currently enjoying his efforts and the ability to enjoy good weather in a safe outdoor area. Congratulations David Kim!